Ann V. Collins, PhD, is associate professor of political science at McKendree University, Lebanon, IL. Collins, Ann. 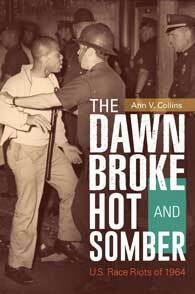 The Dawn Broke Hot and Somber: U.S. Race Riots of 1964. Praeger, 2018. ABC-CLIO, publisher.abc-clio.com/9781440837258. What were the socioeconomic conditions and factors that produced the instances in which riots erupted in northern U.S. cities in 1964? This book examines the year in American history that brought a new era in race relations to the nation.